Arsenal laboured again in the Far East and completed their tour of Asia with a draw against Hong Kong champions Kitchee. Arsene Wenger’s team were twice behind and were rescued for the second time in six days by German teenager Thomas Eisfeld. The 19-year-old, signed from Borussia Dormund for £420,000 in January, came off the bench to equalise with 12 minutes remaining. On Tuesday, he had been sent on against a Malaysia XI with his team trailing 1-0 and equalised before Arsenal found a late winner. Kitchee went ahead after eight minutes to the delight of 40,000 capacity crowd inside the Hong Kong Stadium and scored again after Theo Walcott’s equaliser to lead at the break. Wenger’s team fly back to London having won one, drawn one and lost one of their three games, scoring four and conceding five. 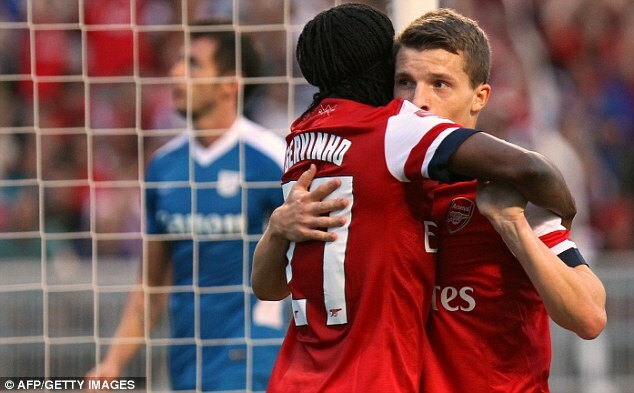 They have rarely been fluent, although Walcott and Gervinho caught the eye in Hong Kong, as well as Eisfeld. Wenger started with his team in a 4-3-3 formation, as he did in Kuala Lumpur on Tuesday, with Francis Coquelin the deepest of the midfielders, Abou Diaby to his left and Oxlade-Chamberlain to his right. Kitchee, managed by a former Barcelona youth coach Josep Gombau, with a heavy influence of Spanish players and former Fulham centre-half Zesh Rehmann in defence, played with the same Barcelona team shape. The Hong Kong champions started with confidence, quickly unzipping Arsenal’s inexperienced back-four. Craig Eastmond, at right-back, covered well to clear the first danger but the Gunners were soon behind. A loose pass from Ignasi Miquel was intercepted in the eighth minute by Lam Ka Wai, who slid a pass between centre-halves Miquel and Johan Djourou. Wojciech Szczesny, playing his first football since his red card in the opening game of Euro 2012. Arsenal responded. Marouane Chamakh forced a save and Walcott went close before the England winger levelled in the 24th minute. Diaby won the ball deep in Kitchee territory, found Walcott inside the penalty area and the he beat goalkeeper Wang Zhenpeng at his near post. Walcott, by far the most threatening of Arsenal’s attacking players throughout, provoked whoops of delight from the home crowd by celebrating with the Chinese symbol for 'Respect', something he recalled from a kung-fu workshop in Beijing, earlier in the tour. The lead lasted only five minutes. Daniel Rodriguez stormed forward from left-back and lashed a shot into the top corner after Szczesny made a terrific one-handed save to beat out an acrobatic effort from Cheng Su Wai. Kitchee offered little in attack in the second half, focusing first on defending their lead but struggled to contain Gervinho as they tired. The Ivorian became increasingly influential and created the equaliser for Eisfeld 12 minutes from time, weaving into the penalty area from the left wing. Eisfeld applied a composed finish with the inside of his right foot. The Gunners pressed for a winner but it did not materialise. Gervinho was close in stoppage time but Zhenpeng saved with his legs.